Now what’s really interesting is that we had something else to talk about tonight but let’s be real—as of six seconds ago that went right out the window because you’re all just looking at the ladybugs. And you are now questioning both my practical sensibilities and my propensity for hyperbole, as well as where on earth I acquired five thousand ladybugs so let’s get that out of the way. Last one first—the internet. Moving backwards, yes, this little box does contain, I kid you not, five thousand live ladybugs which I shall now rest precariously on the edge of this table while you nervously do volumetric equations in your head which I believe addresses the first question in the form of confidence that I am now quite clearly the most stable-minded man in this room. Accept facts, gentlemen, facts I created; ladybugs are small and you can fit five, that is FIVE thousand of them in a tiny box. You are the closest you have ever been to five thousand ladybugs crawling all over the floor and that is blowing your god damned mind. You can also fit them in a large baggie or a plastic container like the ones you get spices in from the local farmer’s market, so if you are trying to put a semblance of day to day life into the situation then yes, I suppose you could say a six month supply of fresh tarragon could safely be absorbed in its entirety by the collective volume of five thousand ladybugs. Do you know how much these cost? Ten dollars. That is the meager fee to instill the most whimsical aspect of fear in a small room of people such as this. I could have walked on stage with a loaded shotgun and solicited all but a yawn in comparison to the silent terror I am aware many of you currently have to the prospect of five thousand ladybugs descending upon this room. Ten dollars, kiddos. Ten dollars for what could easily be a dozen shotgun shells’ worth of ladybugs and yes I am literally suggesting an economic, humanitarian, and environmentally-friendly alternative to armed defense of one’s home because if you were stupid enough to disturb my domicile and found a four-to-five-foot scatter radius of ladybugs fired at you at supersonic velocity you would at least for a moment wish you had just taken 12-gauge ball bearings to the face instead. Consider that because for the purpose of this negotiation you are figuratively in my house. Gentlemen, I have credited my success to nothing if not my adaptability to a rapidly changing world and such is the case of the small rupture that has just occurred in my tiny box of ladybugs. I am literally losing my leverage on a steady albeit microscopic scale. That said, from a business standpoint I believe my hand has now been forced. You have little time and I have little patience and also I have this little slingshot. It is from Party City and came in a twelve-pack for less than the cost of the sentient ammunition that now seeks to carve its own path in the world, and by world I mean your pants legs. The time to decide if you are with me against the world or part of that world which has gone mad is now. Gentlemen, the remaining eleven slingshots are in the trunk of my car, just outside that door wherein lies your freedom, and if it has not been painfully clear from the onset of this merger negotiation, my hope this entire time has been for your to join, not oppose me. In this, my most vulnerable position, I am forced to concede my ample control over the whims of this miniature army of terror is speculative at best. Several of them are now climbing up my arms and thusly as I am hoisted by my own petard I implore you to lift your pens and sign the contracts before you. I thank you and shall now run screaming outside to await your decision. 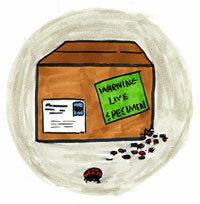 This entry was posted in Essays and tagged Ladybugs by August J. Pollak. Bookmark the permalink.